I have been looking for the perfect maxi skirt for months. I want one that is floor length, a chevron pattern, and fitted in the waist, but not squeezing my thighs. Oh and price was a big factor to me as well. Well I didn’t find one. I started looking online for a chevron knit fabric to create my own and found the best place to purchase knit fabrics. 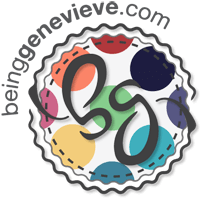 Girl Charlee Fabrics is the best website in price and with the most pattern styles. I promise. 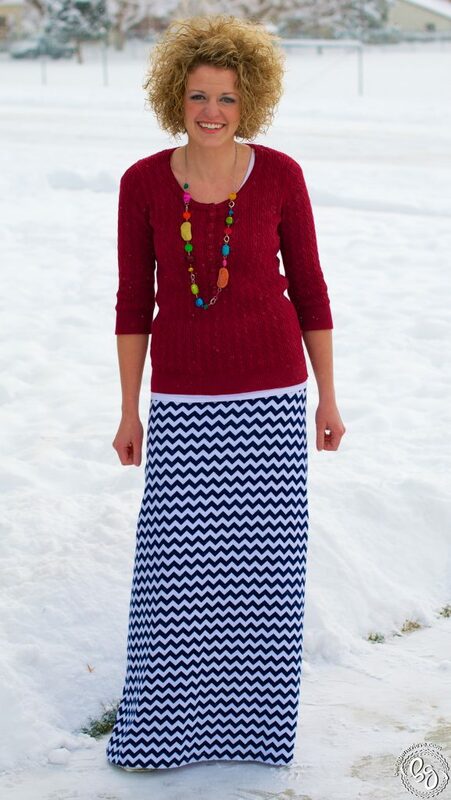 I wanted a chevron that was a neutral color so that I could wear it with multiple tops. I decided on a navy blue, but I am tempted to make a bright color maxi skirt later. 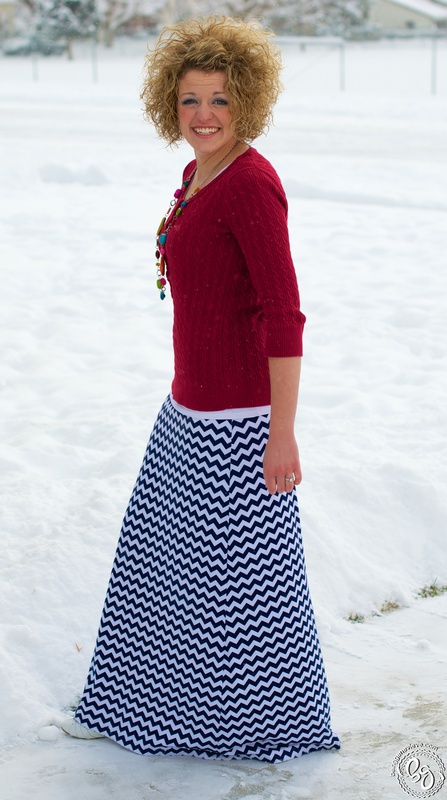 As I was looking around online for the perfect place to buy chevron knits, I stumbled upon a tutorial on how to make a maxi skirt. I read it and was so excited because it was the same way I was imagining to make mine and her’s looked great! Nothing is better than imagining something and before having to do all the tricky work in figuring out how wide to cut this-and-that, seeing someone has already done it. Sarah from The Winthrop Chronicles has put together, in my mind, the best maxi skirt tutorial out there, free of charge. BUT I do have a few very minor changes that I recommend before making your own. Fabric Amounts. I should have bought 2-1/4 yards, not 2. I am 5′ 4″ in height. I made it work, but I only had 1/2″ to spare. Waist measurement. 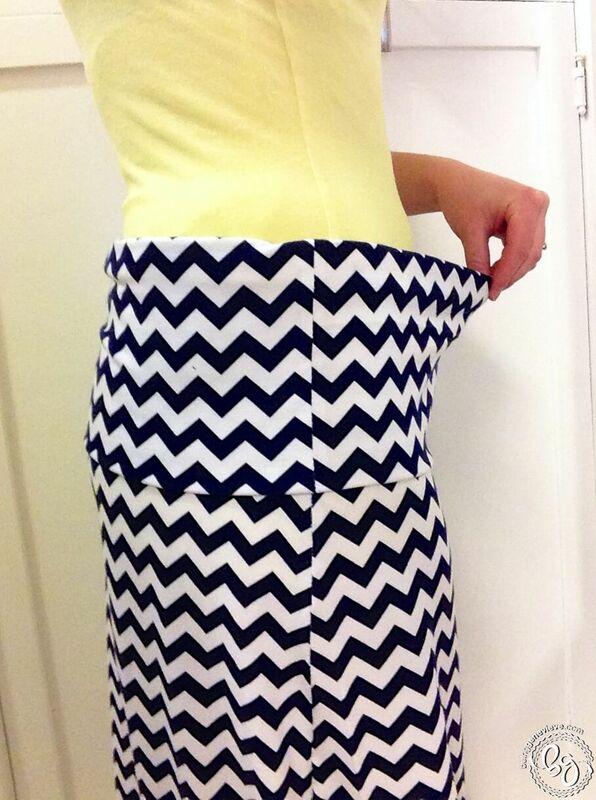 I wear my skirt on the top of my hips, so that is where I measured. I then divided by 2 and added 1″. The top of my skirt ended up being VERY baggy. I unpicked it and changed the top. I personally would measure where you plan to wear it, divide by 2 MINUS 3″ (don’t add the 1″). This will make it fit how mine does in the featured image. Hem. In the maxi skirt post it mentions just cutting a straight bottom and not hemming. I would never do this! Either do a double stitch or a blind hem (which I did). In this picture, you can see what the incorrect waist measurement looks like. I wasn’t pulling the fabric at all. This is how it hung, just loose and baggy. Besides these minor changes, I loved how the maxi skirt tutorial was put together. (The width at the bottom of my skirt is 38″) I hope you make your own and enjoy yours as much as I love mine! Looks cold there in Utah…. Very excited to make one of these after I lose ten more lbs! Thank you for the kind words and the link back. This maxi is absolutely adorable!